Diocletianus, his radiate, draped and cuirassed bust right. Minted at officina A in Lugdunum (Lyon, France) in 290 A.D.
Sutherland, C.H.V., "Roman Imperial Coinage", Volume 5 (RIC), Part II, p224, nr 28 (C). variation with radiate, helmeted and cuirassed bust right. Cohen, H, "Descriptions Historique des Monnaies frappees sous l'Empire Romain" (C), Volume 7, p430, nr. 147. 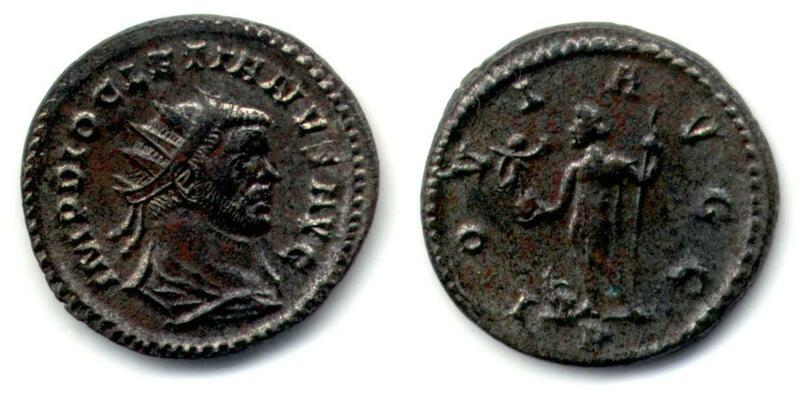 Van Meter, D., "Handbook of Roman Imperial Coins", p276, nr. 25.